This is perhaps one of Shostakovich’s best known symphonies, and the work that saved him from disrepute with the Stalinist authorities, following the attack in Pravda on his opera Lady Macbeth. First performed in 1937, the symphony has made its way very firmly into the twentieth century orchestral repertoire and performances and recordings abound. 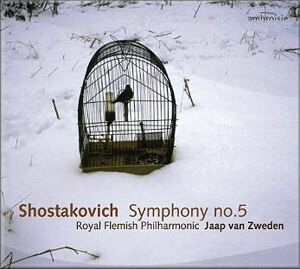 This rendition by the Royal Flemish Philharmonic is beautifully packaged, with a poignant cover image of a caged bird in snow. The disc itself, however, gets off to something of a shaky start: the opening bars are rushed, with the gritty dotted rhythms played a little half-heartedly. I was also a little disappointed by the phrasing. The string lines lack the intensity and elegance that I have become used to with this work. Only after the brass and percussion are unleashed does this music come to life. Their energy seems to pervade the whole orchestra and carries the music along. The second movement has a wonderfully light and jovial character, with some well played wind solos. The bassoon at the opening was particularly enjoyable. The orchestra captures the waltz feeling very well, and the solo lines are not over-indulged. The slow movement is well paced, with space for expression without dragging. Although this is not the most expressive recording of this movement I have heard, it works well, with exciting climactic moments and an impressive dynamic range. This orchestra has a real strength in its fortissimos. The sound is warm and unforced and possesses a wonderful intensity. The final movement bursts into life with energy and vigour. This is a strong opening, full of spirit and drama, despite a loss of intensity occasionally in the quieter moments. Of the four movements this is the most successful on this recording, building tension dramatically towards the end. Overall this is a reasonable recording which shows off Shostakovich’s music well. The sound quality and balance are excellent, and apart from a few very minor intonational moments the orchestra is technically well controlled. This recording, however, is not the best I have heard of this symphony; nor is it the worst. There are some moments of excellence, but somehow the interpretation left me cold. This is a symphony which can drag the emotions to the limits, and this never happened in this somewhat sterile recording.